And that is price anchoring. Is $4 a fair price for a cereal? What about $3? Is that a good deal? Well, if your price perception has been anchored at $4, $3 seems good. It makes sense that we humans would take this mental shortcut with a low-price item like cereal. How many of those do we buy while on a shopping trip? In a week? We’ve got other things to think about. We can’t calculate the supply and demand of the box of cereal and determine a fair price. We can’t determine what inputs went into the cereal — from the cost of the wheat to the gas that runs the trucks that brought the cereal boxes to the store. But what about a high-priced item that we buy rarely? One that we research heavily? Nope, humans are no better there either. Car manufacturers frequently reference the MSRP, the Manufacturer’s Suggested Retail Price. As I’m sure you can see, that is merely price anchoring. The car maker is starting the terms of the price conversation. Price anchoring doesn’t only work with the product itself. It also works with comparative products. This is sometimes known as choice framing or the framing effect. Humans don’t understand universal value. Everything is relative. 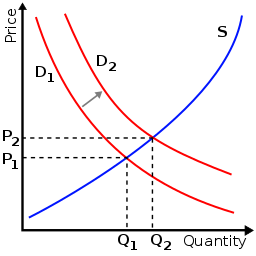 Not only will we compare the price of what a product costs, we’ll compare the price of products we think are related to it in some way, and contrast those with the price of what we’re buying. One of my favorite (tongue-in-cheek) examples of this was in a fast food restaurant I’d eat at in college called Miami Subs (which is making a comeback lately as Miami Grill). 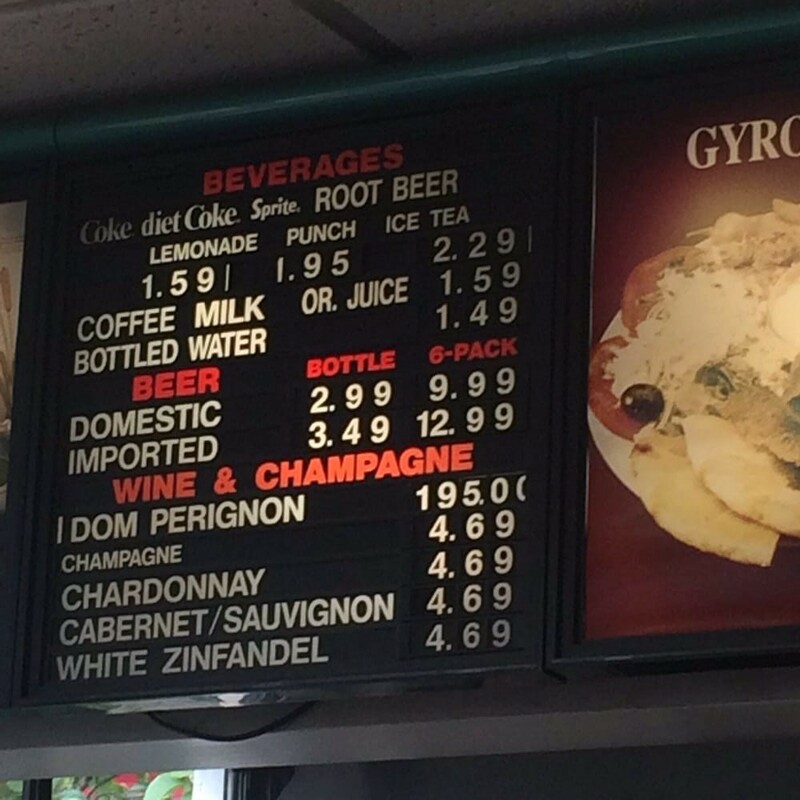 Hey, compared to $195 for Dom Perignon, $4.69 for a glass of Chardonnay doesn’t sound too expensive now does it? Cost is only one half of the equation though. Value can be anchored as well. As the brilliant behavioral economist Dan Ariely explains, when black pearls were first introduced to the market, the marketers behind the product had famed jeweler Harry Winston put them in window displays paired with precious gems like rubies and sapphires. As a result, black pearls are still considered quite valuable today. Remember, all value and cost is just perception. It has been widely reported what an iPhone actually costs to make (e.g., $220.80 for an iPhone 7 that sells for $649), and yet many customers value it so much more than just the cost of its components that they pay a premium. (To get super deep for a moment, the value of money itself is also only perception. Since leaving the gold standard, a U.S. dollar doesn’t have a fixed value. It only has a perceived value because we all agree that green piece of paper is worth something. The exact value of which is actually decided by the market, even while influenced by the government). A marketer’s job is to communicate well enough to shape this perception and ensure customers understand the value they will receive by purchasing the product. Let’s look at another tactic in that process. Another way to use price presentation to influence price perception is with decoy marketing, also known as decoy price modeling. 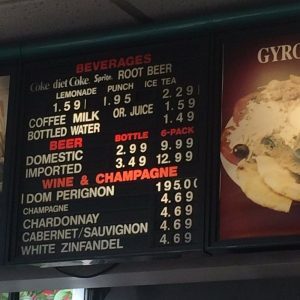 Take a close look at those prices. 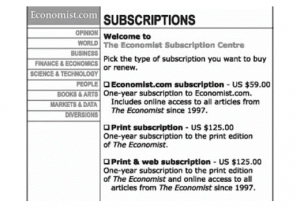 If the Economist.com web subscription costs $59, and the one-year subscription to the print edition of The Economist costs $125, then the fair price of the print and web subscription combined should be $184. But it’s not. It is also $125. In reality, the stand-alone print subscription is a decoy. No one is expected to buy it. 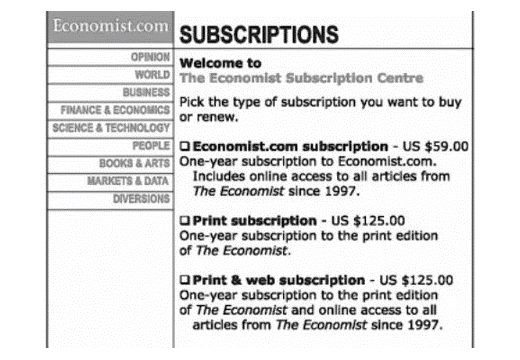 I assume this is a way to nudge print subscribers to try the web subscription as well. Price anchoring and decoy marketing are a key part of common marketing tactics like discounting (from an anchored price) or upsells (occasionally from a decoy, closely priced option). But don’t push it. People aren’t our mere playthings that we can manipulate with a basic understanding of human psychology. For one, that’s just wrong. For another, it can backfire in a serious way. These tactics work when they’re subtle and fair. Customers understand that you need to make money on your product, and that there is room for discounting in there from time to time. And they understand that you may want to incent behaviors by offering an entry-level product they can buy but you rather they didn’t (a decoy), to get your attention for the action you really want them to take. But, in the hands of a less-skilled and more heavy-handed practitioner, subtle nuances of human psychology that should be used like the deft hands of a surgeon wielding a scalpel become bludgeons smashing everything in their path in a scorched-Earth attempt to get a sale. To wit, an example from my own life. I bought new gutters for my house last year before the last hurricane season started churning up here in Florida. The first guy came out, took some measurements, and gave me a price. When he was done, he was trying to feel out our reaction. Only, my wife and I weren’t quite sure he was done, and didn’t respond. We were a bit lost in the whirlwind of calculators and discounts. So he started chopping some more. If we couldn’t trust him to even understand what the price was, how could we trust him to have workers walking around on our roof putting up gutters? So we went with our first quote. And this brings our conversation around to where we started — the marketplace. While the market will decide the price, the market also helps anchor the price. If your anchor is wildly off, many customers will know you’re trying to fool them thanks to information freely available in the market. And the market will also decide what it thinks of your price presentation strategy. 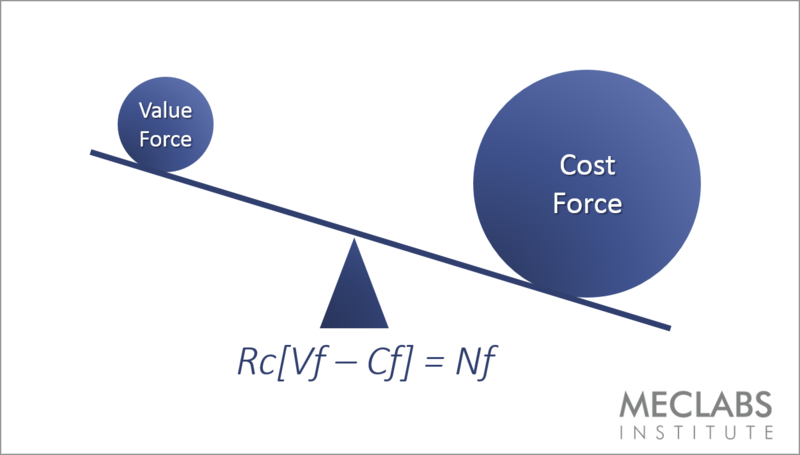 Understand psychological mechanisms like price anchoring and decoy marketing well, and you can help customers understand the value and cost of your product in a chaotic, confusing world. But overplay your hand, and you will burn the trust of your potential customers. They don’t have to buy from you. They will readily purchase from your more trustworthy competition. So, dear marketer, all I’m saying is this. Our entire global economy rests on your capable shoulders. Present the price well and commerce will flourish. The market will hum like a precision-engineered vehicle of value creation. Customers will bear the cost they must pay for value produced and delivered. Trade will span across vast oceans. And the great world will spin. However, fail in your efforts and the mighty machine will seize. Trust will plummet. Transactions will cease because parties on both sides won’t recognize a value exchange. An economic nuclear winter will descend across modern society, and we will be taken back to the dark ages before the specialization of labor. Email Marketing: Why phishing emails (unfortunately) work … and what marketers can learn from them Marketing 101: What is funnel creation?